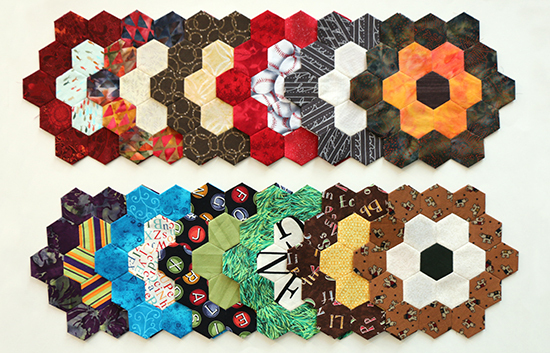 I can hardly believe that it’s been four weeks since my last update on The Hexagon Project. 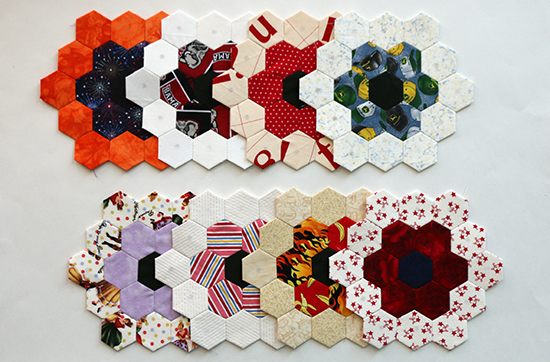 This month, I hand stitched three more English paper piecing hexagon flower blocks for my Grandmother’s Flower Garden quilt, bringing my total up to 20. I feel good about how far this project has come over the course of the past six months or so. I’ve started laying out the blocks to get an idea of how I might want them in the final quilt. The colors are working well together, and I’ll likely use the pink sparkly fabric between the flower blocks as I originally planned. Eight blocks with a dark middle ring and light outer ring. Last I checked, I had en equal number of blocks with a light middle ring/dark outer ring, and a dark middle ring/light outer ring. At this point, there are definitely more blocks with a dark outer ring. Twelve blocks with a light middle ring and dark outer ring. While the quantities were even, I had been thinking of arranging the light and dark blocks in alternating rows to create stripes. Now I’m considering other options — maybe a pattern of light blocks surrounded by dark blocks, or maybe a random mix. Of course, with so many blocks yet to be sewn, the balance could still change considerably. Yes, I could look ahead at the hexies I’ve already grouped together to become blocks and create whatever light/dark balance I want. But where would the adventure be in that? Part of the fun for me in working on a scrap project is seeing where those scraps take me. It will be exciting to see where this project stands after the next six months. What long-term projects, or partial projects, are you feeling good about? Oh, my goodness, is this holiday season getting away from anyone else? It’s been nonstop here. On the bright side, between school holiday programs and waiting rooms for checkups I’ve been able to get quite a bit of knitting done despite our busy schedules. On the not-so-bright side — literally — the short days and rainy weather seem to be conspiring against me taking any progress photos. I’m still knitting away on my Diamond Pullover. The front and back pieces are done, leaving me with about a sleeve and a half to knit before I can sew the sweater together. I still hope to have it ready in time for Christmas. Or maybe New Year’s Eve. The projects that I knit as gifts earlier in the year — a Dingle Hat, two Scandinavian Hats, and a pair of Meida’s Mittens — have been wrapped and mailed. I can’t wait to hear whether the recipients like them. Our home is decorated for Christmas, and we’ve begun food preparations. I spent so much time kneading a troublesome batch of dough for chruścik, a sweet crisp Polish pastry, that my activity tracker registered it as a cardio workout and said I hit my step goal. 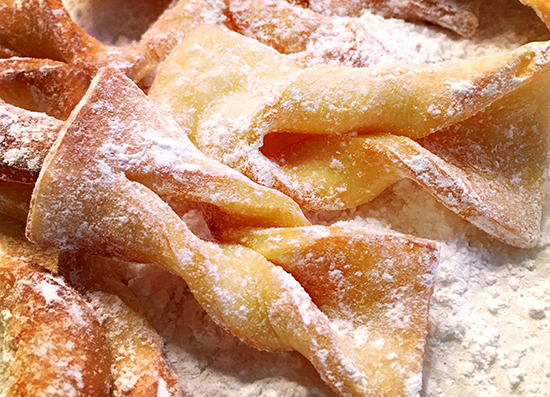 Dusted with powdered sugar, chruścik are also known as “angel wings. This week will likely be just as busy, with end-of-semester projects and exams followed by wrapping gifts and baking cookies. It’s still making, just a different kind: making merry and making memories. I wish you the best in all that you’re making as 2018 draws to a close. 'Tis the season — for kits! I always seem to end up digging through my stash of project kits this time of year. Many of the kits are Christmas-themed, so on that level the timing makes sense. However, they’re rarely as quick and giftable as I want them to be. This week’s kit is an exception. 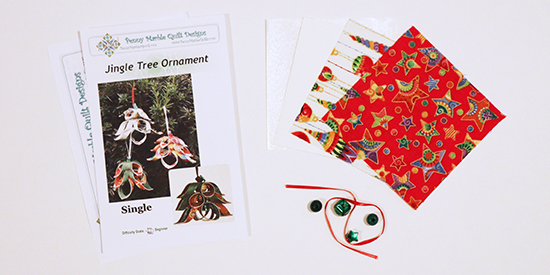 A few years ago, I was given a beginner’s Jingle Tree Ornament Kit from Penny Marble Quilt Designs, complete with all of the necessary materials except glue. Although it’s made with fabric, this is a no-sew project. I don’t want to give away they entire process, but I will say that the most difficult part of making the tree ornament was punching the holes into the fabric-covered paper strips. I actually broke a sweat! Note to self: A hole punch can be sharpened by punching through aluminum foil. I wish I had looked that up earlier. The entire project took only about an hour to make, which is great for quick holiday gifts. I used quick-dry craft glue, and the most time-consuming step was still holding the pieces together as I waited for the glue to set. 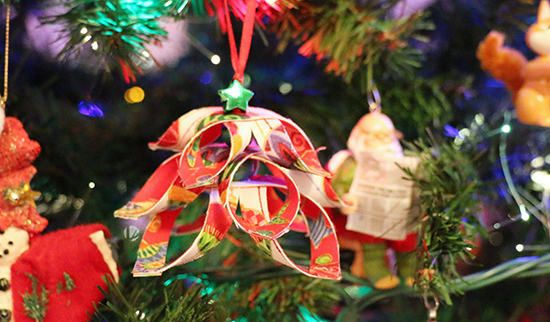 To construct the ornament, the three fabric pieces are strung onto a piece of ribbon along with a star for the top, two large beads to serve as the tree trunk, and a small bell at the bottom. Yes, it really does jingle! I wouldn’t recommend this kit for young children because it requires the use of an iron, plus the patience to hold the pieces together as the glue dries. But it would be a fun holiday activity for older children with supervision, teens, and adults alike. I’m definitely going to come back to this pattern again. 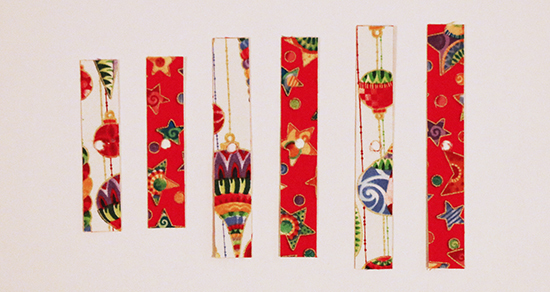 What are your favorite quick and easy projects for holiday gift-giving?